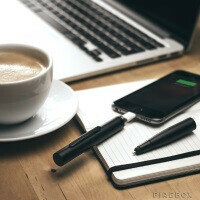 A pen and a phone charger - two of the items people borrow from you most often. It makes so much sense that they have officially become one - and the end result is called Power Pen. So what are we signing up for here? First off, the pen is actually a sleek stylus made of brushed-aluminium. Give it a good twist, though, and the ballpoint pen shows up, all primed and ready to remind you precisely how much your handwriting has deteriorated since the computer keyboard (thankfully!) become commonplace. That's only its second magic trick, though. Twist the other end, and you're accessing a built-in battery with both lightning and microUSB ports. Pop the cap and you can start re-charging your smartphone. How convenient! Alas, the 700mAh battery is only good for a small jump-start, but in battery deficient situations, anything is better than nothing. The Power Pen costs about $40 (£24.99) and is sold in Black and Gold. It plugs into any USB port - computer, wall charger, external battery pack, etcetera. It's up for pre-order now, while shipments will start Dec 29. Is this the way that Apple products think catch up with the Samsung? seriously?? Bad copying and featureless sens.